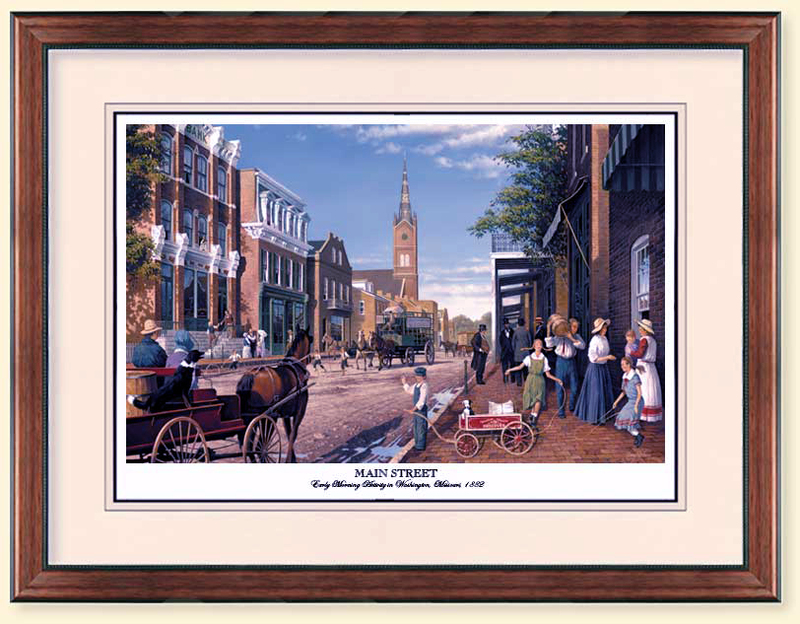 ?MAIN STREET: Early Morning Activity in Washington, Missouri,1882” was created as a symbol of what makes a strong successful city. The church steeple represents a strong faith based community. The children playing alongside their parents signify dedication to family. The hefty, well built work wagon alludes to the pervasive characteristic of strong work ethics. Note the name on the side of the wagon. F. Bleckman and Son has been a family owned business in Washington since 1834, a 176 year heritage which is a tribute to their dedication. Standing on the sidewalk, gentlemen in suit and tie discuss city affairs and improvements. These community leaders are a symbol of the strong volunteer spirit citizens of Washington have possessed from the beginning. 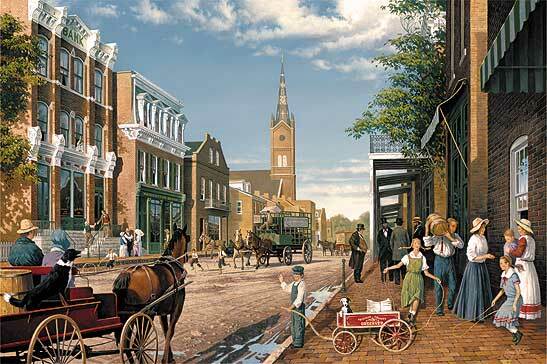 Lastly, the depiction of the Bank of Washington’s newly completed 1880 Main Street facility represents the ever-present strong financial backing Washington has had throughout its heritage. Today, staring down Main Street on a clear morning, you can see a lot of changes. Buildings have grown and expanded. Businesses have spread along the street. Horsepower engines have replaced the horse and buggy. Nothing stays the same. Yet, despite the turning of time, the evidence of a strong foundation remains. The strength of a community lies in its people, those that work, play, and live there. The values of family, faith, and business are the keystones in building their town.